Slice the carrots into equal pieces, approximately the size of your finger. Remember, things of relatively equal size will cook at the same speed. 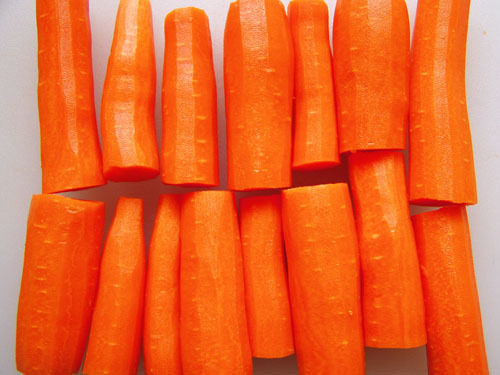 If you can, try to match your carrots a bit and split them so the pieces are approaching uniformity. It’s a good practice whenever you’re cooking multiple units of the same thing. 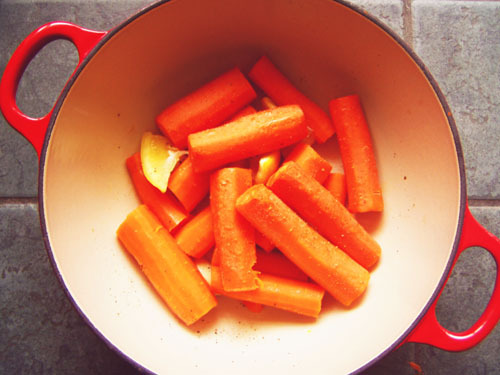 Add the carrots and other ingredients (except the olive oil, if you’re making variation 2) to a small saucepan. Cover and begin cooking over medium-high heat. Once the water boils, begin timing. Check the carrots with the tip of a knife after 10 minutes – if they are soft, they’re done. Drain the water and toss the herbs. Now comes the fun. I roasted the carrots, lemons, and garlic from variation 1 in a small dish for 12 minutes at 400 degrees. It brought out the flavor of all three ingredients even further and made for a delicious side dish, both hot and cold. I tossed the carrots from variation 2 (no lemons, just carrots) into my food processor and blitzed a few times until they were mostly chopped. 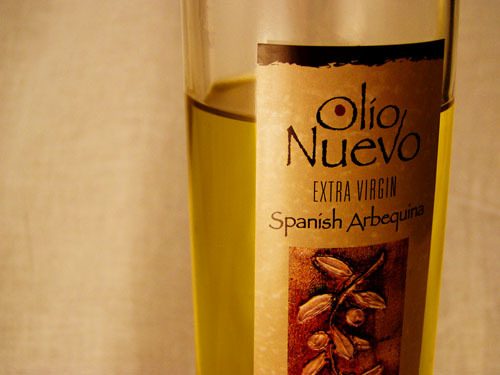 Next, I added the olive oil at a slow pour – almost a drizzle – through the top of the processor lid while letting it run. The result? 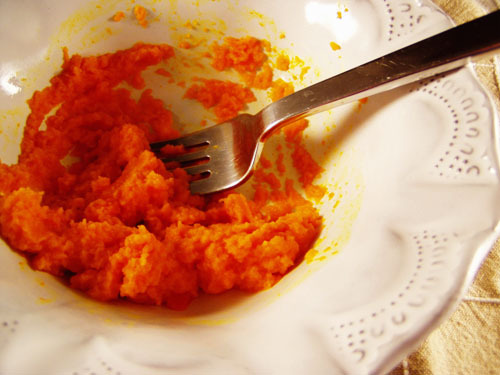 Tangy, feather-light mashed carrots. I am sorry to say they only lasted about 5 minutes after I scooped them into a bowl. In fact, I almost forgot to take a picture and had to intervene with my camera before polishing off the last few bites. The Salty Spoon is powered by	WordPress 2.7 and delivered to you in 0.294 seconds using 24 queries.